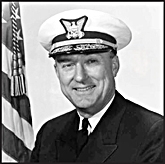 Rear Admiral John D. McCUBBIN, United States Cost guard (retired), age 94, passed away peacefully November 3, 2008, at his home in Steilacoom Washingon. Born in Wichita, Kansas, Admiral McCubbinn was raised in Dallas, Texas. After graduating from the United States Coast Guard Academy in 1939, he served as an Ensign aboard the USCG Cutter Taney in Honolulu, Hawaii. In 1942, after completing Naval flight training at Pensacola, Florida, he was assigned to anti-submarine warfare duty, flying out of Greenland during World War II. He served in operational and command positions in search and rescue at Port Angeles, Washington, Elizabeth City, North Carolina, Kodiak, Aklaska, Barbers Point, Hawaii, San Francisco, California and Washington, D.C. While serving as Chief of Staff for the 17th Coast Guard District in Juneau, Alaska, he was promoted to Rear Admiral in 1969. He was then assigned as Chief, Office of Reserve for the Coast Guard in Washington, D.C., receiving honors as Minute Man of the Year by the Reserve Officers Association. His final assignment was Commander, 8th Coast Guard District, New Orleans, Louiiana. On June 30, 1973, Admiral McCubbin retired after more than 45 years in uniform, including 34 years of commissioned service. His many personal decorations include the Legion of Merit and Air Medals. Admiral McCubbin was much admired by servicemen of all ranks. An extremely generous and kind man, he was highly regarded for his integrity, devotion to duty and outstanding strength of character. A man loved by all who knew him, especially his family, he will be dearly missed. As he often said, "I've had a good life, thanks:to the people who helped me." John was preceded in death by Margaret Budd of Summit, New Jersey, his wife of 48 years. He is survived by wife Mary Frances, children John D. McCubbin, Jr. of San Francisco, California and Sandy (Richard) Sander of Seattle, Washington, sisters June Wergin of San Antonio, Texas and Margaret McCubbin of Sacramento, California and granddaughters Christina and Katherine Sander. Burial with full military honors will take place at Arlington National Cemetery on 4 May 2009. Remembrances are suggested for USCG Academy Alumni Assn., 47 Mohegan Avenue., New London, CT 06320, CG Aviation Assn. (Pterodactyls), PO Box 222905, Chantilly, Virginia 20153 or Little Church on the Prairie, Lakewood, Washington.